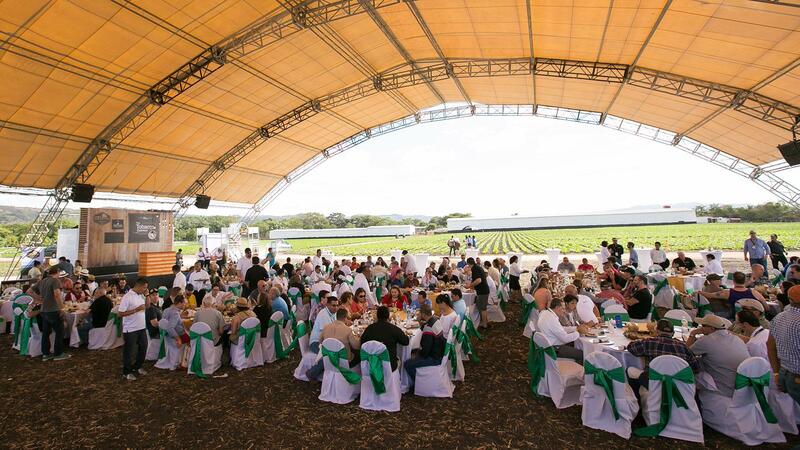 Attendees enjoyed a fine lunch on day four at My Father Cigars' La Estrella tobacco plantation. Premium cigar enthusiasts from all over the world flocked to Nicaragua last week to attend the sixth Puro Sabor Festival del Tabaco, a celebration of the country's rapidly growing cigar industry. The festival, which drew about 300 registered guests, took place from January 16 to 20. It was hosted by the Nicaraguan Chamber of Tobacco, a collective that, with the addition of four members this year, consists of 28 companies with facilities in Nicaragua that either grow tobacco, produce cigars or create packaging. Joining the organization in 2017 is 1502 Cigars, El Galan Cigars, Tabacalera RC (tobacco growing) and Distribuidora Karibe (cigar packaging). Puro Sabor provides companies involved in the Nicaraguan cigar industry the perfect platform to showcase their operations. Festival-goers not only enjoy a myriad supply of world-class cigars, but also have the opportunity to tour most of the members' factories and tobacco fields in the now-booming city of Estelí, often with the principle owners guiding the tour groups and answering questions. This year, festival organizers added a cultural component to Puro Sabor, as attendees stayed two nights in Granada, a colonial city located near the volcanoes of western Nicaragua, before shifting the action to Estelí where the majority of the country's cigars are produced. "The sixth edition of the Puro Sabor festival has consolidated its position as one of the world's best cigar festivals, not only thanks to the quality of the cigars but the quality of the services in our country," said Juan Ignacio Martinez, president of Joya de Nicaragua. "Most important, this festival has allowed us to strengthen our ties between our members inside our industry and become a stronger collective than before, allowing us to communicate and work together for the improvement of the conditions in our sector and to protect the well-being of our workers and our companies." After landing in Managua airport, attendees were bussed to the city of Granada, where participants checked into their hotels and received a canvas backpack filled with festival swag, including a box of 32 cigars. More than 400 revelers dined, drank, smoked and danced at the festival's "white party" held at Plaza Domingo Gadea. The box of cigars included many well-known Nicaraguan brands, a few in sizes that were created especially for the festival, each with a unique Puro Sabor footband. The cigars in the box include: My Father, Victor Calvo Shade Reserve, Plasencia Reserva Organica, Brick House, Farm to Factory, Serie V Melanio, Rocky Patel Nimmy D, Joya de Nicaragua Cuatro Cinco, Guardian of the Farm, Padrón Family Reserve 45 Years, Drew Estate Liga Privada No. 9 and Undercrown Shade, Enclave by A.J. Fernandez, Wunderlust from RoMa Craft Tobac, Mombacho's Liga Maestro, Omar Ortez Original and CAO Gold. On day two, attendees had the opportunity to participate in eco-tourism, one of Nicaragua's major industries. Attendees were able to tour the Granada Islets, a series of volcanic islands in Lake Nicaragua, and then they could visit the Mombacho Volcano Natural Reserves. There, lunch was served before a tour of the Mombacho Cigar Factory, makers of Liga Maestro and Tierra Vulcán. That night, the festival held its opening dinner at La Pólvora, a restored colonial fort located in Granada. The next day, festival-goers boarded buses heading to Estelí, the heart of the nation's cigar industry. The buses pulled into the Plasencia Family Farm for lunch and then dispersed for the first series of factory tours: Tabacos Valle de Jalapa S.A. (TABSA); Rocky Patel's Tavicusa; Nica Sueño (RoMa Craft Tobac); Procenicsa (tobacco processing); Nicaragua American Cigars S.A. (NACSA); Plasencia Cigars; and Drew Estate Tobacco Company S.A. The morning of day four of the festival was devoted to more factory tours, with groups choosing from facilities such as Oliva Cigars, Padrón Cigars, Joya de Nicaragua, J.C. Newman's Puros de Estelí Nicaragua S.A. (PENSA); A.J. Fernandez; and My Father Cigars. After the tours, the groups then reconvened at My Father's La Estrella tobacco plantation, where they found an arched covering erected right on one of the tobacco fields. There lunch was served, and then participants were treated to a cigar-and-coffee pairing seminar. At each of the dining events, cigar girls passed out a generous amount of smokes to all attendees. That evening, the ladies and men donned white dresses and white guayaberas, respectively, for the traditional "white party," held at Plaza Domingo Gadea, in the shadow of the Biblioteca Municipal Alcadia de Estelí, located right in the center of the city. The final day focused on plantation visits, with groups getting the chance to tour the fields of Padrón, My Father, A.J. Fernandez, Plasencia, NACSA, and A.S.P. Nicaragua S.A. Guests were then treated to a pig roast lunch served inside one of A.J. Fernandez's curing barns, before dispersing for another afternoon of factory visits. The festival's closing gala dinner was held on the property of Drew Estate Tobacco. Additionally, Juan Martinez, who served as president of Nicaraguan Chamber of Tobacco for the past two years, announced that he is passing the baton on to a new president to lead next year's event—Anielka Ortez. She is general manager of AgroTabacos, a tobacco and cigar operation that's been in business since 1996.